By far the coolest and most complicated Hamilton clock I've ever laid hands or eyes on is the WWII-era H-37500 Elapsed Time Clock. 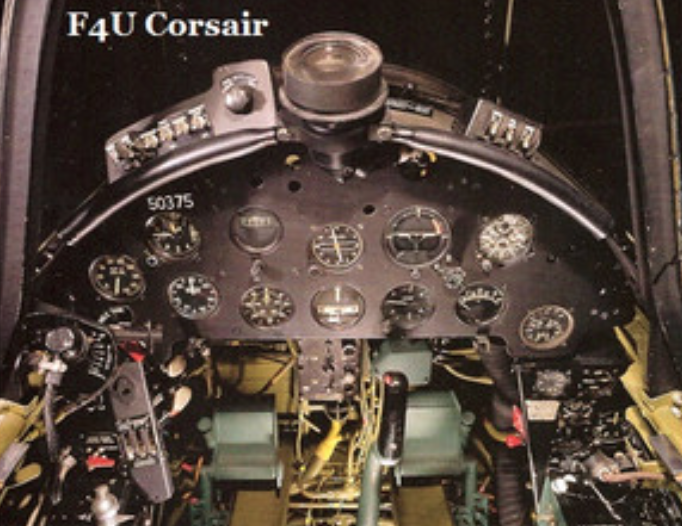 This specialized clock was designed for the US Navy for use in the F-4U Corsair as well as several other platforms. It also goes by the part number AN-5741-1. Although the H-37500 was first produced in 1944 - it was used on various platforms into the 1980's, including on US Navy P-3 Orions. So what's so cool about the H-37500? Well - it is an 8-day, 16 jewel movement with two mainsprings. It has 5 different registers that do things like indicate the date, serve as a stopwatch, track elapsed time, and of course, tell the time of day. That's pretty cool - right? Well how about installing it behind a 2,000 horsepower motor, sending it into harms way, landing it hard - day after day onto a carrier deck and then leaving it the rain and blistering sun 24x7? There are over 400 parts inside that make the clock "do it's thing" so overhauling one of these bad boys is not a do it yourself project. You can see it in the upper right of the cockpit photo below. The clock was jointly developed for the military by Hamilton and Elgin. So you can find the Hamilton H-37500 or the Elgin E-37500. They are largely identical - although you can bet the Hamilton version is better (ha ha!). Accurately measuring elapsed time is a critical part of navigation. Imagine taking off from a carrier, flying a few hundred miles, kicking the crap out of the enemy and then having to make your way back to the carrier at a different location without running out of fuel. You'd need to know how long you'd been flying and in what direction in order to have any prayer of getting to where you wanted to go. I've wanted to get one of these for a long time. They are readily available but I wanted to get one that was already in good shape and not too much of a project for me. Call me a wuss, if you will, but I draw the line at say, 50 parts. 416 is way too complicated for me to figure out on my own. You can tell by looking at the clock that it's meant to be installed in the instrument panel. Although it's quite capable of standing upright on it's own. There are different dial patterns, depending on the installation of the watch. Sometimes they are white on black. In my case, it's the WWII green and yellow pattern that shows up well when UV lamps illuminated the cockpit instruments at night. The clock is secured inside a gasketed case. There's a screw-off plug that gives access to the regulator if the beat rate needs to be adjusted - that way you don't need to unscrew the myriad fasteners that hold it all together. I couldn't help myself, I had to open it up and see what makes this watch tick - literally. Here's some shots of the inside. I think I can honestly say that if I took this clock apart I would comfortably have 20 extra parts left over when I was finished trying to get it back together. There is a repair manual though, AN05-35A-11, should you feel the itch to tackle one yourself. Going back to the front - I'll give you an orientation of what does what. The knob on the lower left winds the watch. Just turn it clockwise and you're off to the races. The dial is a 24-hour dial so 12-noon has the hour hand pointing down. The register on the left is the date - so when the hour hand goes around the dial once, the date will index to the next day. The little "set" button next to the winding knob will index the date one position when it's depressed. The knob on the upper right actuates the chronometer (stop watch). Push it and it will start the stop watch. The large second hand in the center (pointed at 14) is the second hand for the chronometer. The little green hand in the small right register is the clock's second hand. When the chronometer second hand goes around one minute, the yellow hand in the upper register will index one space and will continue for 60 minutes. If you push the upper right knob again it will stop the chronometer and pushing it a third time will reset it to zero. The register at the bottom is the elapsed time indicator. This 12-hour register is a stop watch too. There is no second hand though, just a minute and hour hand. If you push the winding knob on the lower left, it will start this function. Since there's no second hand, the indicator dot will switch to red - to tell you the elapsed time indicator is running. If you push the winding knob again, the elapsed time indicator will stop and the window switches to yellow and red. Pushing it a third time will return it to zero and the window switches to yellow. Although my clock has been serviced, it was running about 70 seconds slow per day on my timer. That was an easy fix though - as just a tweak to the regulator got it running right in line with a good amplitude and low beat error. Great article, thank you. My father in law, a retired watch maker, recently gave one of these to me. It has the green dial instead of the yellow. I figured out everything except how to turn the hands to set the correct time. Can you a help a fellow collector? Did you use the timegrapher with the conograph function running? Not that I recall. Just with the basic clock running. I have S/N 006949. It is fully functional. My father likely pilfered it himself as he worked as an aircraft mechanic during wartime. I probably should have asked him about it when I could have. I have s/n 001529. Finally got it working, but it runs fast even after adjusting. May need new balance. Thoughts?